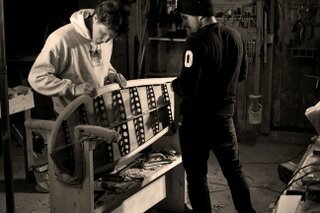 For the past few weeks, pro surfer Ben McBrien has been gracing our basement workshop in York, ME. He surfs for Zoo York Institute, one of the oldest and most soulful skate/surf companies in the world. Ben and I sat down and designed a Steve Lis inspired 5'4" fish. Now he's building two of them pretty much on his own using the GSb method. Not only can the guy rip water, he's can re-saw wood. Stay tuned for the christening this spring.